The Philadelphia Zoo announced on October 5, 2006 their decision to close its elephant exhibit by the spring of 2007 and transfer all four of its elephants to other facilities. The zoo's three African elephants, Petal (50), Kallie (24) and Bette (23) will move to The Maryland Zoo in Baltimore. The zoo's sole Asian elephant, Dulary (42), will move to The Elephant Sanctuary in Tennessee. The zoo has been under pressure for several years from groups such as Friends of Philly Zoo Elephants and Save Elephants in Zoos to find better homes for their four elephants. These groups argue that elephants require more room and more natural conditions than they current have in numerous major zoos across the country. The four elephants currently occupy a quarter-acre yard with an 1,800-square-foot barn that was built in the 1940s. The Philadelphia situation was brought to a head by two major factors. 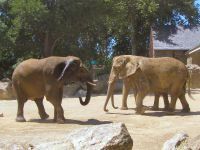 First, while the older two elephants, Petal and Dulary had lived together peacefully for many years, the introduction of the two younger elephants, Kallie and Bette, in April 2004 changed the living dynamic. The Asian elephant, Dulary, sustained a serious eye injury in August 2005 in a fight with the younger African elephant, Bette. Dulary has been separated from the others since that time and pressure has been great to find her a new home. The zoo had hoped to include a new elephant 2.5-acre savannah in their capital improvement projects which include the Peco Primate Reserve, Bank of America Big Cat Falls and the scheduled new Bird House and new Children's Zoo. Last year, however, the zoo dropped plans for a new elephant exhibit citing difficulty in raising the $22 million which would be required. From the time that decision was made, it seemed clear that it was only a matter of time before the elephants would be relocated. The zoo has maintained for years that their current exhibit meets national standards for elephant care and in fact when compared to other zoos such as the National Zoo in Washington, the exhibit does appear comparable. Clearly, however, outside pressure played as much as role as funding problems in finalizing the zoo's decision. Personally I find this to be a sad, but correct decision. The elephants have always been one of my favorite exhibits at the zoo and one of the most popular with all visitors. The treatment that the elephants receive at the Philadelphia zoo has always appeared much better than elephants receive in circuses. The fate of these magnificent animals in the wild is still very tenuous. The numbers of elephants in the wilds of Africa and Asia continue to decline in the wake of human encroachment and poaching. It is forseeable that the day will come when the only elephants that survive are those held in captivity. For this reason zoo and elephant reserve breeding programs are essential for the survival of the species. It is not only sad, but somewhat of a shameful reflection on all of us who are friends and members of the zoo that it came to this decision. The nation's first zoo should have a modern elephant exhibit where we and our children can forever view these animals in conditions that they deserve. Perhaps the day will come in the future where pressure, perhaps due to attendance declines, will force the zoo to reconsider its capital funding priorities. Unfortunately, however, confined as it is in Fairmount Park, the zoo has limited room for expansion and funding always remains a problem. For now we can only hope that Petal, Kallie, Bette and Dulary are happy and live long lives in their new homes.